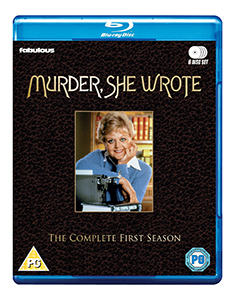 It’s the third day of our Christmas giveaway with Fabulous Films and today we’re giving away a copy of Murder She Wrote: The Complete First Season on Blu-ray. The Blu-ray delivers all 22 Season One episodes including the suspenseful original pilot movie, The Murder of Sherlock Holmes. Angela Lansbury stars in the role that earned her 12 consecutive Emmy nominations and 10 Golden Globe nominations as everyone’s favourite super-sleuth, Jessica Fletcher, a famous mystery writer who has a knack for solving murders on and off the page. Along with the quirky residents of Cabot Cove, Jessica is joined in her deliciously suspicious tales of mystery and mayhem by some of the most celebrated guest stars of screen and stage, including Leslie Nielsen, Joaquin Phoenix, Andy Garcia, Martin Landau & Milton Berle. The competition closes at 23.59 (GMT) on Tuesday 18th December 2018.